The DVD for this feature-length OVA was given to me by my cousin visiting from out of town–thanks Neil!–and it’s a fine continuation of the Stand Alone Complex branch of the multifaceted Ghost in the Shell franchise. It shares most of the strengths of the TV series; in many ways it could be just another 4 episode arc. 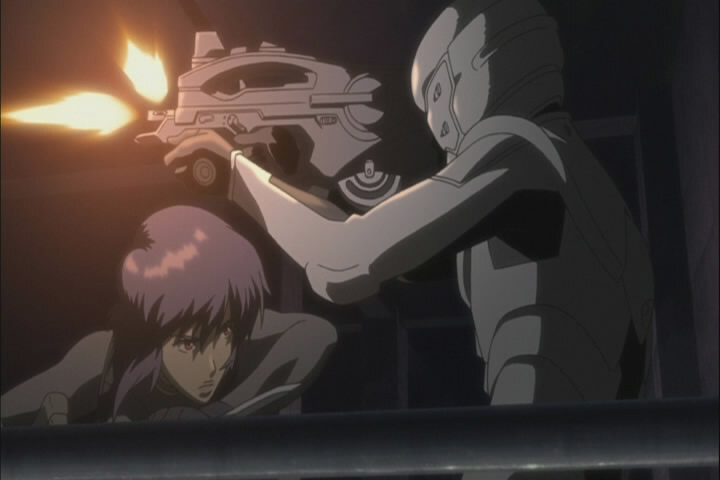 But in many ways, it is also the Stand Alone Complex‘s staff’s attempt to do a variation of the first GitS film, and when placed side by side with Mamoru Oshii’s masterwork, the places where the movie worked well also become clear. While I respect Mamoru Oshii’s films artistically and historically, as the first GitS film was one of the breakthrough animes in America, I’ve never warmed to them. This is despite loving philosophy, theology, and art films in general. I’ve always felt Oshii wants to wear his education on his sleeve–he too began in a seminary, and he always loads his films with overt symbolism and quotations from the Bible. Even for this academically inclined seminarian, the Innocence film took these tendencies to absurd heights: something like half the dialogue was simply quotations from various scriptures, philosophical works, and literature. Oshii is very much an idea-driven filmmaker, a self-conscious intellectual. His films are thus rich for academic study and analysis–heck, I’m going to be writing a paper soon comparing the philosophical stances of the Matrix trilogy and Oshii’s GitS films–but devoid of most of the ordinary pleasures of anime, aside from a few extremely well animated action sequences and Kenji Kawai’s outstanding scores. As I mentioned earlier, Solid State Society is in a strange way a take on the story and themes of the first GitS film. There’s a lot of plot and character differences, to be sure, but the similarities are striking. Both feature a mysterious antagonist called the Puppet Master or Puppeteer. Both are about cybernetic networks taking on a life of their own, with the Major diving in near the end to discover the new reality that this interconnection of brains will bring about. Both end on nearly identical lines. 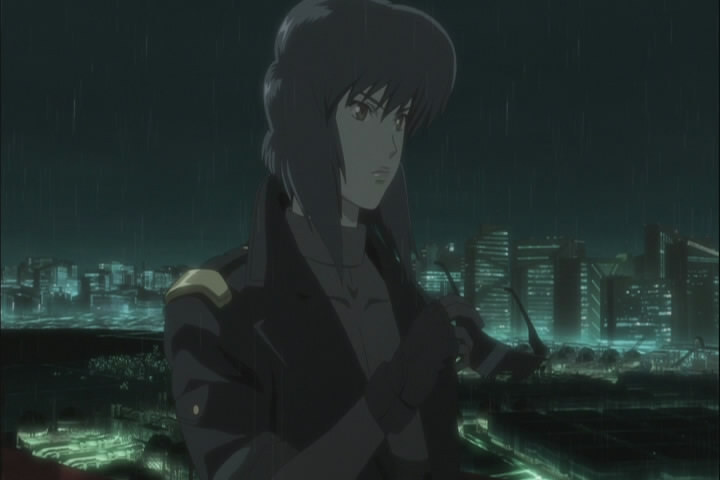 The fact that the Major only gets a prominent role in the second half of the OVA seems almost incidental; so many of the basic ideas are similar. Their differences, however, reveal a lot about the artistic possibilities and limits of the more conventional Stand Alone Complex style as opposed to Oshii’s arty approach. SAC often felt like a standard police procedural much of the time, with a heavy focus on plot exposition and tracking down clues. Solid State Society is no different; the plot twists more than once and the emphasis on political and social intrigue is as pronounced as it was in the TV series. 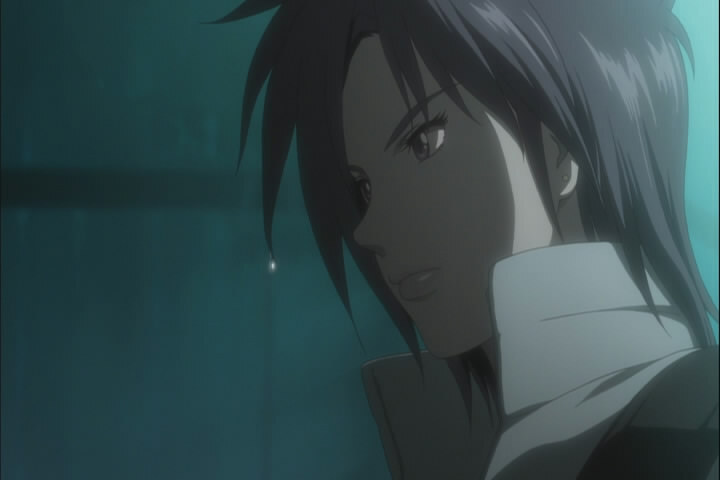 The pacing of the OVA–which really is a feature film in every other respect–flagged at times. I sometimes struggled to piece together the clues, characters, and complex strands of plot, and I confess the ending baffled me at first. There was relatively little time for meditation or reflection, even though the pacing was similar to the relatively slow pace of the TV series. And that is where Oshii, for all his flaws, shines. 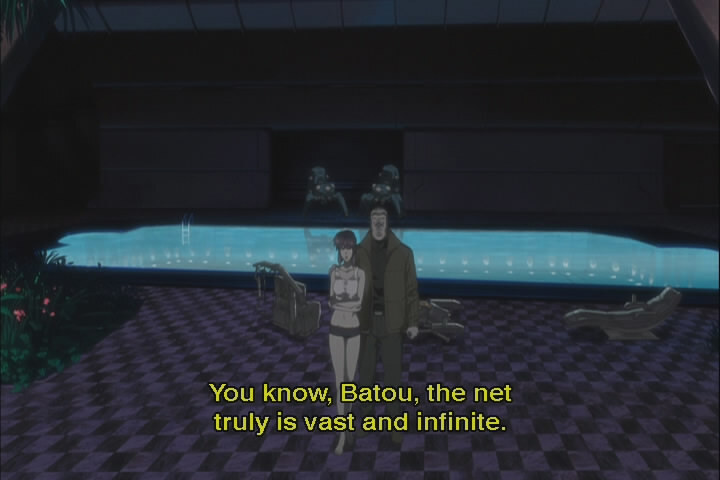 Both GitS films are deeply contemplative. There are scenes where it is simply just urban scenery, or a parade, set to Kenji Kawai’s awe-inspiring music: atmospherics that give the viewer some space to think and usually to slip in some symbolism (mannequins, robots, etc). Indeed, Oshii loves overt symbolism, whether it be shooting up a map of human evolutionary descent in the first film or the entire doll motif in the second film. It’s often too much, particularly when paired with overly intellectual dialogue, but it is always striking and memorable. Solid State Society features the same quality animation we found in the TV series, which was very high indeed, but it is much more “ordinary” by comparison. 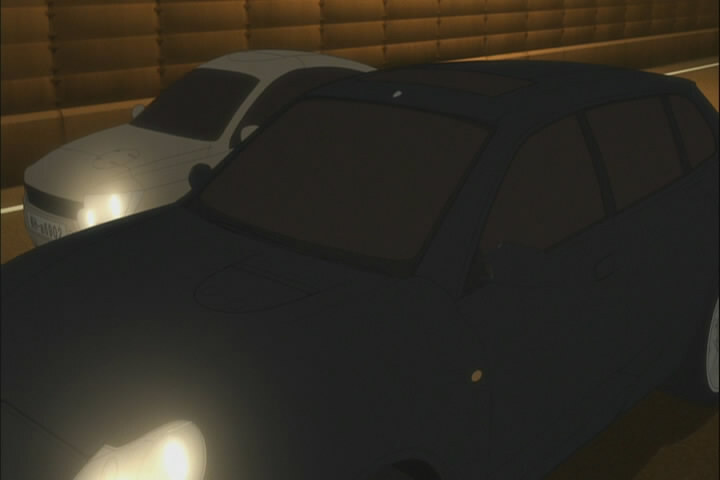 The CG was obvious, particularly in driving scenes. I remember few visual scenes from SSS, while I can think of many evocative and powerful shots in Oshii’s films, usually paired with Kawai’s music. I never thought I’d ever say this, but in SSS, I think even the great Yoko Kanno’s talents are largely wasted on indistinct electronica background. One otherwise notable piece was constantly disrupted awkwardly by dialogue. A lot of this, granted, can be chalked up to the differences between TV and film; TV always contains more closeups than film does, for instance, and usually require faster moving and twisting stories to keep viewers interested in the next episode. There is no room to simply bask in visual and aural splendor. But I still think at the end of the day, Oshii’s work is more visceral. While the last lines of both Oshii’s first film and this one are nearly identical, they seem to come to different conclusions. Oshii’s film almost seems to celebrate the prospect of all minds being united as one in the Net, with bodies being exchanged at will. SSS ends on a typically TV Mulder/Scully kind of buried emotional moment, one we’ve seen in the SAC series before–in other words one that affirms a much more organic and real kind of connection to people, though it’s hopeful for the future. The choice to make the Major a possible culprit was also notable. She is less passive than she seems in Oshii’s films, an actual moral agent whose intentions are worth exploring as opposed to a vehicle to deliver ideas. It depends, I suppose, on what one is looking for out of the GitS franchise. I don’t entirely buy the final twist of SSS, which takes a turn into the kind of willful twisting obscurity that some anime like to indulge in. It’s nevertheless a much more involving and dynamic story than either of Oshii’s films. Characters have understandable motives, and even change and grow. The plot is complex without usually being convoluted, whereas Oshii sometimes stopped the plot altogether in order to focus on some beautiful visuals. The action doesn’t feel as divorced from the rest of the film as it sometimes does in Oshii. On the other hand, one expects a series with the title Ghost in the Shell to offer some actual insight into the mind/body problem. The SAC branch was as much about political intrigue, and SSS is no different–but in doing so, spotlighting Japan’s current fertility and aging problem, it almost seems like it’s in danger of missing the rationale behind the series altogether, as well as the most interesting dilemmas posed by a society where a significant number of people have cybernetic brains. Those issues were always front and center for Oshii, and while he doesn’t execute it as elegantly as he probably could, that is one of the primary roles of science fiction: to ask questions and think ahead about the implications of technology. (Similarly, I love the current Battlestar Galactica as a drama, but the contemporary political and social allegories are sometimes way too obvious; by the third season, it’s clear that the show is really about Iraq and the War on Terror more than anything else.) Oddly enough, I think the TV series was a bit better on that front, but that might be because of its greater length. The ending of SSS attempted to bring it back home to the original themes of the franchise, but in a way that felt a little rushed and arguably contrived. The climax was definitely much more weighted toward a statement about race, immigration, and elder health care. I see GitS as much a contributor to the cyberpunk genre of SF as William Gibson’s Neuromancer–a nuanced look at what happens to a society where the distinction between man and machine is blurring. What safeguards, dangers, and opportunities might that present, when we discover just how vast and infinite the Net can be? At its best, Stand Alone Complex and SSS offer some rumination on those issues while delivering a decent story and well-animated action. Oshii offers mostly the former, but memorably. If you enjoyed the Stand Alone Complex TV series, you will certainly enjoy Solid State Society; it feels little different from it. Those who prefer the movies will not find anything particularly new or different to change their opinion necessarily. Previous PostEl Cazador 16 – My preciousss! My tacosss! My Elisssss!Next PostClaymore 16 – Clare’s revenege really doesn’t mean much. You’ve projected way too much from the rest of the franchise onto this film. Why don’t I see the word ethics in this review? I love both sides of the franchise deeply, and though I ultimately lean in favor of Oshii’s approach and respectfully disagree on a few points about him here, this is a really great writeup that articulates the differences between franchise branches extremely well.